In Colorado, the Marijuana Enforcement Division (MED) requires that substances used in cultivation – such as fertilizers and approved pesticides – be listed on a label. 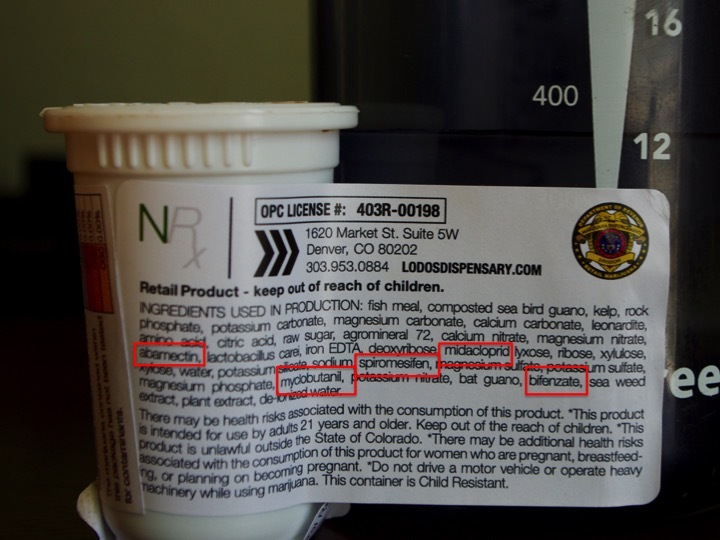 Astoundingly, the active ingredients of five pesticides that have been explicitly prohibited by the Colorado Department of Agriculture (CDA) and the MED for use on cannabis are still listed blatantly on the label. See the images below for a picture of the label, with the illegal pesticides highlighted in red boxes. The second image is a sticker attached to the bottom of the container, partially visible in the first image, attesting to the date of purchase. Label attached to package of cannabis flower purchased from Natural Remedies in Denver. Active ingredients of pesticides illegal to use on cannabis highlighted in red boxes. Click image for larger view. Label affixed to bottom of container shown above. Lists date of purchase. 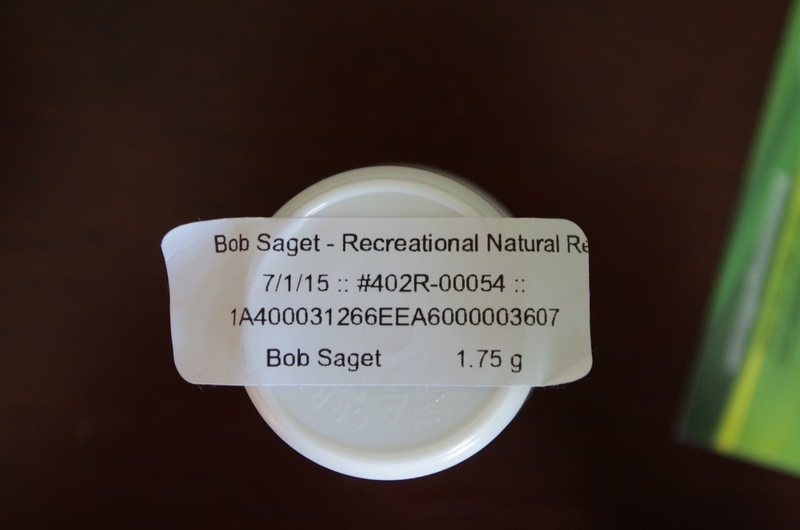 The strain purchased is called Bob Saget, for those wondering about the presence of the comedian’s name. Brief information on each pesticide found on the label, as well as a link to general facts on the chemicals and their most common product labels, are listed below. The descriptions of crops for which each pesticide is approved come from the linked labels; it should be noted that different formulations containing the same active ingredient can be listed for use on different crops, including edible ones in some cases. Again, while some of these products and chemicals may be listed for use on certain consumable crops, none have been approved for use on cannabis due to lack of research. Abamectin: Active ingredient in Avid 0.15EC and other miticides; produced by Syngenta; not approved for use on any consumable crops. Imidacloprid (this chemical is misspelled on the label): Active ingredient in Merit 75WSP and other insecticides, also sold generically; Merit is produced by Bayer; label lists turf and ornamentals as approved crops and also states that this product is not for use in commercial greenhouse production, which is the category in which the CDA classifies indoor cannabis production. Spiromesifen: Active ingredient in the insecticide Forbid 4F; produced by Bayer; listed for use on turf, landscape ornamentals, fruit and nut trees, and interior plantscapes. Myclobutanil: Active ingredient in the fungicide Eagle 20EW, the pesticide for which Organic Greens was previously cited; produced by Dow; listed for use on turf, ornamentals, apples, stone fruits, and grapes. Bifenzate: Active ingredient in the miticide Floramite; produced by Chemtura; not approved for use on any consumable crops. I was floored to find that an operation cited just a couple months ago for illegal pesticide use would continue to list illegal pesticides on its label for all to see. I will allow for the possibility that the operation has ceased using these products, but has not yet updated their labels. In that hypothetical, this is a simple oversight, but one that reveals an overall lack of attention to detail (in this case, a fairly large detail), as well as providing a window into the prior practices of Organic Greens/Natural Remedies. It is to be hoped that the proper authorities will promptly investigate the practices of this operation and determine whether they have in fact stopped using illegal pesticides, especially since this is a highly patronized medical and recreational dispensary in the heart of downtown Denver. If further information or developments are forthcoming, I will update this post accordingly.